Darlin’ Deals Review ~ Baby Trend Nursery Center Playard! Disclaimer: I received a complimentary Baby Trend Nursery Center to review. I was not persuaded to write a positive review. All thoughts and opinions are my own. When preparing for baby’s arrival there are so many things to purchase and deciding which products to buy can seem daunting. One of the things I learned with my first child was that some baby products are used more often then others and surprisingly one of the things that I got the most use out of was the playard. We took a playard on trips to visit Grandma and on every vacation we went on during my son’s crib years. Of course with baby #2 arriving 5 years later I was in desperate need of a new playard for her since I sold the one that I had for my son when he was a baby. Luckily Baby Trend was generous enough to send me a Baby Trend Nursery Center Playard in exchange for my honest review. Upon receiving it I set up the Nursery Center with the Bassinet/Changing Table option and was pleased with the height of the bassinet inside the playard, it made placing my daughter in the playard convenient. The Bassinet felt secure and I was completely comfortable with allowing my daughter to nap in it during her early months before reaching the recommended maximum weight of 15lbs. Now that my daughter has recently surpassed that weight I look forward to testing out the playard using the base portion for her sleeping area on our upcoming vacation. One of my favorite features of the Nursery Center was the Electronic Music Center. This console has a music, vibration, and night-light option. My daughter loves music and I frequently use music to soothe her when she is fussy so having this console attached to the playard was very handy! The nature sounds were very relaxing and she seemed to enjoy it when I played it for her. Another feature that is included on the Nursery Center is the Toy Storage Pocket that I actually used to store diapers and burp cloths for convenience during those late night diaper changes. The Nursery Center that I received was the Close N’ Cozy model that includes a removable bassinet. This additional feature is a major bonus if you will be using a playard early on with your little one, however I received the Nursery Center after my daughter had outgrown the recommended weight of 10 lbs. so I was unable to utilize that part. Some of the perks of the Close N’ Cozy bassinet (as described on Baby Trend’s website) are that it can be used with playard and securely fastens to any bed. It is also portable and freestanding. Music center includes two styles of music, and nature sounds. Bassinet/Changing Table: Birth ~ 4 m, weight: up to 15 lbs, height: up to 25″ whichever comes first. No monetary compensation was provided to Darlin’ Deals only a complimentary product was sent for review purposes. This adorable and very highly rated LeapFrog Learning Friends Adventure Bus is currently priced at just $7.05 (normally $19.99). Target: School and Office supplies just $0.20! 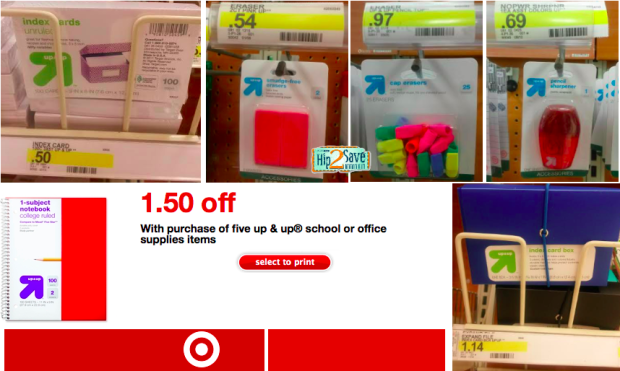 There is a $1.50/5 Up & Up School or Office Supplies Target store coupon available that makes some school and office supplies as low as 20¢ each after using the coupon on purchase of 5 items priced at 50¢ each! Remember prices may vary by store. Learning Resources Farmers Market Color Sorting Set on SALE! When my son was learning his colors I received the Learning Resources Farmers Market Color Sorting Set to review and it was by far the BEST toy and educational tool! It is currently 51% OFF and I highly recommend purchasing it. It has excellent reviews and teaches much more than colors, it also teaches children how to sort, helps them to learn fruit and vegetables and much more! Darlin’ Deals Review & Giveaway ~ Doc McStuffins Cuddle Me Lambie DVD! Disclaimer: I received a complimentary advanced copy of Doc McStuffins: Cuddle Me Lambie on DVD to review. I was not persuaded to write a positive review. All thoughts and opinions are my own. I have a confession to make, I have never seen a Doc McStuffins episode before… I know, I know how is that possible since I have 2 small children?! Well having a 5 year old boy who is obsessed with Jake and the Never Land Pirates, Mickey Mouse Clubhouse, and all other ‘boy-ish’ Disney things it just never came into our rotation of shows. Now that I have a little girl I am excited to start delving off into the world of all things girly that Disney has to offer. After watching just 1 episode from this new movie I have to say it is a new favorite Disney show of mine! This new movie, Doc McStuffins: Cuddle Me Lambie, is set to hit the shelves on February 3rd and it includes 5 new episodes of Doc McStuffins and her loveable stuffed animal patients. Included inside this DVD is an adorable set of Exclusive Lambie Hair Clips (seen on my daughter in photos above). If you’re looking for a cute Valentine’s gift for the Doc McStuffins fan in your life, this is it! Each episode carries a theme of caring about feelings and loving each other. My favorite episode was the one where Lambie is diagnosed with a ‘broken heart’ because she feels less special when Doc gets a new animal to love. Doc reminds her that there is enough love to go around and nobody is left out. Another favorite of mine is when Doc McStuffins helps her brothers stuffed bear because her brother can no longer play with him since he sneezes every time he hugs him. With a simple diagnosis of the ‘dusty musties’ Doc determines that a good wash will help clean up the bear so her brother’s allergies won’t be affected every time he hugs his bear buddy. I am excited to continue watching this sweet series with my kids and I’m sure it will be a frequent show in our rotation of Disney movies! Disney has generously offered to give 1 Lucky Darlin’ Deals fan a Doc McStuffins: Cuddle Me Lambie Family Kit that includes Flatware and Movie as shown below! This giveaway is in no way affiliated or sponsored by Facebook, Twitter, or Pinterest. Darlin’ Deals is not responsible for prize shipment. Must be at least 18 years old to enter and have a US mailing address, winner is limited to US or Canada. No monetary compensation was provided to Darlin’ Deals for this giveaway, only complimentary movie was sent for review purposes. Aveeno Baby Calming Bath Wash 18oz bottles just $3.38! Here’s a great deal on Aveeno Baby products – snag a set of 4 (Four) bottles of Aveeno Baby Calming Comfort Bath, Lavender & Vanilla 18oz for just $3.49 per bottle + FREE Shipping! BONUS: Currently you can use promo code PHARMAP5 to get an additional 5% off this purchase making each bottle just $3.38! This adorable My First Disney Princess Rapunzel’s Wedding Dress Up is currently priced at just $9.33 (normally $27.99). We Rock the Spectrum Kid’s Gym Open Play or Birthday Party discount offers! If you’re looking for a place to take the kiddos to get out those wiggles be sure to check out this offer for We Rock the Spectrum Kid’s Gym set of 5 discounted Open Play passes or a discounted Birthday Party! We Rock the Spectrum Santa Clarita is committed to providing a safe, nurturing, and fun environment to foster learning, exploration and safe sensory experiences. Through our nonprofit My Brother Rocks The Spectrum Foundation, we provide social skills groups and activities for children across the spectrum. I highly recommend Kid’s Gym for a safe, clean, fun place to take your children! I love babywearing, so I was very excited to see a deal on this BABYBJORN Baby Carrier Original (in Black)! It is currently 43% off and has excellent reviews. Perfect for newborn & growing babies. Specially developed to give the proper support for baby’s head, neck, spine and hips, and child may be carried facing forward once he or she is a bit older and able to hold up his or head own head.